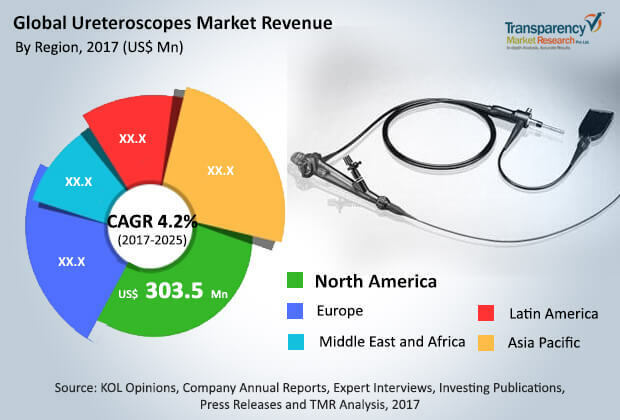 The global ureteroscopes market is characterized by a landscape dotted by the presence of both new entrants and established players, observes Transparency Market Research (TMR). The market also witnesses the presence of several emerging players. Players holding a sizeable stake in the market include Opcom Inc., SCHÖLLY FIBEROPTIC GMBH, Advanced Endoscopy Devices, Inc., Elmed Electronics & Medical Industry & Trade Inc., PENTAX Medical, KARL STORZ SE & Co. KG, Richard Wolf, Stryker Corporation, Boston Scientific Corporation, and Olympus Corporation. Some of the emerging players in the market are Vimex Sp. z o.o., ROCAMED, EMOS Technology GmbH, LocaMed Limited, and Maxerendoscopy. Several manufacturers are increasingly focused on incorporating new, advanced technology, with an aim to stay ahead of others. Several players are also focusing on technological improvements in ureteroscopes, in order to gain a better foothold in the market. The global ureteroscopes market is anticipated to expand at a CAGR of 4.2% during the period from 2017 to 2025. By the end of this period, the valuation of the market is expected to reach US$1.1 billion, expanding from its worth of US$0.8 billion in 2017. Among the various product types, flexible ureteroscopes form the leading segment expected to contribute the leading share of the global market during the forecast period. Their widespread popularity can be attributed to the unprecedented advancements in the imaging technology they bring to the fore. The marked success rate of fiberoptic and digital flexible ureteroscopes in the removal of stones is accentuating the demand. Geographically, North America held the leading revenue share in the global market in 2016. The growth is fueled by the extensive uptake of ureteroscopes in non-invasively treating urolithiasis among patient populations and the recent launch of innovative products. The growth of the global ureteroscopes market rides primarily on the back of continual evolution in the area of ureteroscopy, intercepted by advancements in imaging technologies. The advent and the growing popularity of digital flexible ureteroscope technology is a crucial development accentuating the growth of the market. The incorporation of high-quality digital image sensors has been underpinning striking advancements in ureteroscope technology. This has significantly improved surgical outcomes of ureteroscopy in the removal of stones. The rising usage of flexible ureteroscopes among urologists to diagnose and treat lesions in the upper urinary tract is a key factor boosting the market. In addition, the substantial demand for minimally-invasive approaches in the surgical management of urinary calculus diseases is a key factor accentuating the growth. Bold advances made in the surgical management of urolithiasis in recent years are expected to pave way for new, exciting avenues in the global market. The advent of flexible fiberoptic ureteroscopes to help remove stones safely and quickly is also catalyzing the growth of the market. However, the indiscriminately high cost of reusable and digital ureteroscopes devices may hamper the demand to an extent. Nevertheless, the market will benefit from the adoption of minimally-invasive procedures in managing the rising prevalence and incidence of urologic diseases in young adults. Furthermore, the emerging use of robotic consoles to maneuver flexible ureteroscopes. The growing popularity of robotic ureteroscopes is aiding in the substantial expansion of the market. The rising number collaborations involving hospitals and sizeable investment by key players in developing cutting-edge technologies are creating promising avenues for market players. Constant efforts by manufacturers to products innovations will pave way for promising avenues.